In just one short month many people will be celebrating with their lucky greens. That's right St. Patrick's Day is right around the corner. Many will be pulling out the golds and greens and start crafting away. Which is why I had to share this collection with you. This week we stopped by our Favorite Sponsor. A few weeks ago I shared with you the Sweetheart Stonehenge Collection and I loved it so much that I just had to share this collection with you too. The St. Paddy's Stonehenge is also by Linda Ludovico. I love 3 leaf clovers and I just can't get enough of them lately. Between the colors and textures of the print there is not much I can say about this collection other than .... LOVE LOVE LOVE!! This is a definite must have for any spring collection and I would be so LUCKY if it was in mine. 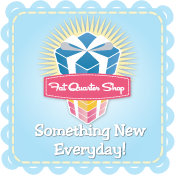 If you haven't had the pleasure of seeing all the amazing collections that Fat Quarter Shop has to offer than you really must take a peak. The site is neatly organized so you can find exactly the style of fabric you are looking for.